Samsung has found itself in a row with Chinese consumers, with some accusing the firm of being biased against them. The South Korean firm has not issued a recall of its Galaxy Note 7 in China, despite local media reports of two devices catching fire. Samsung said it had concluded that the damage was caused by "external heating" so a recall was not necessary. The vast majority of Note 7s sold in China were equipped with batteries made by a local supplier. The callbacks elsewhere have been linked to faulty batteries made by Samsung itself. China is the world's largest smartphone market and of key importance to manufacturers. On 2 September, Samsung issued a recall of 2.5 million phones in certain countries, leaving out China. The firm said in a statement that the phones sold there did not have the battery manufacturing error that has caused fires in dozens of phones in other places. Samsung also assured customers that the Galaxy Note 7s in China that went on sale after 1 Sept were "safe to use". In the last week, Chinese media have reported that two of the devices appeared to have caught fire. Pictures posted online appeared to show charred Note 7 devices. Some Chinese consumers said Samsung's lack of action showed that it was biased against China. "Caused by external heating? The heat of a person's body temperature can cause a phone to explode. Sure," said one user sarcastically on micro-blogging site Weibo. "Samsung doesn't dare raise a fuss overseas but in China as soon as explosions are mentioned they blame other people," another person commented. "China is a big market. Be careful Samsung, don't bully China," warned one user. "I think consumers are pretty unhappy with Samsung," Ben Cavender of China Market Research Group told the Associated Press news agency. He said Chinese consumers "start to feel like they are being taken advantage of, that they are not being accorded the same respect here as they are abroad". In June, Swedish furniture company Ikea suffered a similar backlash after it recalled dressers in the US and Canada but failed to do so immediately in China. It announced a Chinese recall in July. The Chinese battery supplier for Note 7 phones sold in China said the fires appeared to be different from those in other countries. "We believe the heat problem comes from outside the battery. A very large likelihood exists that other factors gave rise to the heat problem," said Amperex Technology Ltd. The company gave no further explanation of what might have caused the problems. Samsung said it had investigated the first phone that was reported to have caught fire, but was unable to obtain the phone involved in the second incident. Reports of Samsung recalling 1,858 phones also emerged on 14 September. Chinese state newspaper People's Daily said it was "insincere" of Samsung to recall almost 2,000 units in China but "one million in the United States". 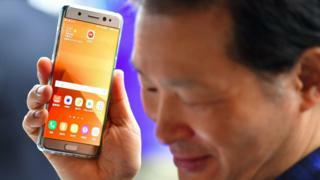 But a Samsung spokesman told the BBC that these units, which were tested before 1 September, had been in use before the phone officially went on the market in China. "They were sold through [a] few sales channels for a test experience. As a preventive measure, we are taking these units back."